Magnetic Resonance Imaging (MRI) is some of the coolest, most advanced technology around. This radiation-free medical imaging uses a strong magnetic field and radio waves to create amazing images of the brain, spine, blood vessels, muscles, bones and other organs and soft tissue. These images help doctors find disease or injury and plan treatment. But what may seem “cool” and amazing for some has, in the past, been a frightening experience for other patients due to anxiety and claustrophobia associated with older MRI technology. Radiology Medical Group of Santa Cruz County (RMGSCC) can help patients overcome these problems with the installation of the new GE SIGNA™ Pioneer 3T MRI in its newly renovated MRI suite. 3T stands for 3 Tesla. That’s the strength of the magnetic field in an MRI machine. MRI strengths in most imaging centers and hospitals today range from .2 to 3.0. In general, the higher the “T”, the higher the image quality. Until recently, there was a trade-off between image quality and wider MRI openings. The wider the opening, the weaker the magnetic field, resulting in poorer quality images. 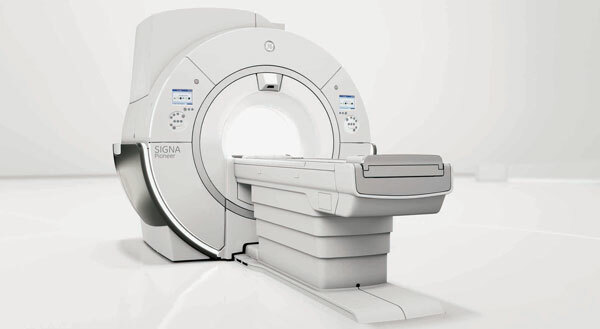 The SIGNA Pioneer 3T at RMGSCC is from a new generation of MRIs called “high-field” that have a more powerful magnetic field and wider opening with no loss in image quality. The Pioneer 3T has an opening ¬– or bore – that is 70 cm, or about 27.5 inches in diameter. That’s about 4 inches greater diameter than other 3T MRIs and up to 20 percent larger than older MRI machines. For patients who are larger or claustrophobic, that can make a huge difference in comfort. With research showing that worldwide, about two million MRI scans are cancelled or terminated before completion each year due to claustrophobia, the wider openings could have a very positive impact. So, if it’s been a while since you’ve had an MRI – or have had one recently but it was on outdated equipment – make sure to check out our new 3T MRI, the most advanced and widest 3T MRI in Santa Cruz County. At RMGSCC, we believe that diagnostic imaging doesn’t have to be stressful, and we work to help create the best patient experience possible. If your doctor refers you for an MRI or other imaging procedure, you’ll benefit from fast, flexible scheduling with results often given to your doctor within 24 hours. For more information visit our MRI page or call 831-476-7711.